The Social Justice Coalition (SJC) is a social movement from Cape Town, South Africa. For the past two years, the SJC has used budget analysis and advocacy as a tool to campaign for decent sanitation in informal settlements. 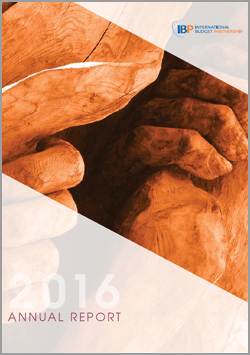 IBP worked with the SJC to undertake research and analysis of Cape Town’s municipal budget in support of the broader advocacy campaign. Initial research in early 2015 focused strategically on those parts of the budget relevant to sanitation in informal settlements. Through that research we uncovered extremely low spending — less than 2 percent of the water and sanitation capital budget was going to informal settlements, even though informal households make up over 20 percent of the city’s population. Faced with this injustice, we began to view the budget process as a set of political moments and institutional processes through which the campaign could move. 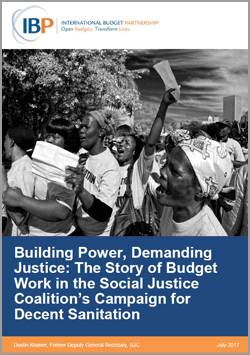 The budget work became an important tactic centered on the need to shift power relations through sustained organizing in, and by, poor and working class communities. In doing so we learned some important lessons on using evidence, finding leverage, and building power. Evidence, facts, and data can be seductive. During the first year of budget advocacy, SJC became embroiled in a war of attrition with the state over the “truth,” where winning the argument over the facts seemed like the goal. That year we facilitated over 500 submissions from informal settlement residents in response to the City of Cape Town’s (the City’s) proposed budget, the first time mass submissions had been made on a municipal budget in South Africa. This was coupled with a public advocacy campaign that argued that capital allocations for longterm sanitation infrastructure in informal settlements were disproportionately small and unjust. Informal settlements were effectively being treated as permanently temporary. There were no long-term plans for infrastructure in these communities, but rather a consistent use of law enforcement to contain the growth of informal homes. This followed a difficult history of the struggle in South Africa against urban influx control during Apartheid and the rights of black African people to be part of the city. We thought that the City would change course when faced with such compelling facts of injustice. The pushback, however, was relentless. Cape Town Mayor Patricia de Lille used her budget speech to attack and mock the SJC as an organization driven by nefarious political agendas and self-enrichment. At every turn, the City obstructed, attacked, and undermined. SJC countered each response, usually through more facts and evidence. By the end of 2015 we understood that we did not have the right leverage and that a fight over the “truth” was not going to take us any further. Trying to win an argument, without finding the leverage to actually challenge power, could never be a winning strategy. Political organizing does not happen in a vacuum; there are many external pushes and pulls that influence the best way forward. Many planning tools can tempt one into simplistic logical frameworks of easily matching inputs, outputs, and outcomes. Things are not so linear in struggles for power, especially in contexts of deep inequality, spatial segregation, and historical injustice. But this doesn’t mean that there is only chaos. On the contrary, strategy needs to be constantly interrogated, and we always have to find the best way in. One rarely starts a campaign with a full understanding of every piece of the puzzle. In our case, the budget work during the first year was a wedge that pushed open the process. 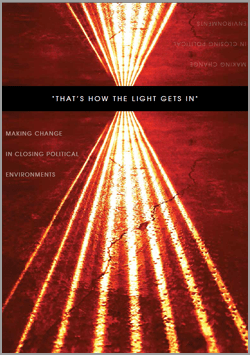 It helped us to systematically unlock a political and institutional understanding and space into which the campaign could move and build the leverage it needed. Sometimes finding the right leverage can be immediate. Other times it can take months or even years to build and comes through ongoing struggle. This is where the power of evidence does in fact lie. First it provided the knowledge SJC needed to develop deep budget literacy education within the organization and our branches, allowing us to undertake meaningful mass organizing and uncover a deep injustice. Second, it helped us to better understand the target and was a building block in developing a political strategy to take the campaign forward. By 2016 we had developed additional layers of the specific pieces of evidence needed to litigate against the City on its prioritization of temporary services in informal settlements. This will be the next step in the campaign. Mass based campaigns can set a political agenda and disrupt institutions. First, the City budget was largely uncontested prior to 2015. The SJC campaign pushed the mayor into a position where she had to actively defend the decisions of her administration and be held accountable. Second, the political agenda of informal settlement residents penetrated formal spaces of power. In a situation where the voices of informal settlement residents are so marginalized and their distance from spaces of power so great, the importance of this cannot be overstated. A provisional review of the impact of the SJC campaign shows that allocations for informal settlement sanitation have started to slowly move upwards after years of stagnation. But at the heart of the campaign was placing the voices of informal settlement residents at the forefront of politics and, however imperfectly, reshaping those politics. This is, at least to me, one of the most important pieces of the story. Sanitation made many issues around informal settlements tangible — tenure security, land injustice, racial inequality, and the severe barriers people face when trying to take part in the most basic decisions affecting their lives. These problems can seem so big and intractable, but they are deeply urgent. Now the campaign will be looking for the next wedge by which it can move and the layer on which it can build. Fiscal Futures: Is There a Space for Better Fiscal Accountability in South Africa’s Metropolitan Municipalities?